Free-to-play nature said to not include purchasable weapons. Hot on the heels of Sony’s E3 press conference last night, Famitsu held an impromptu interview regarding the newly revealed Let It Die for the PlayStation 4 with designer Goichi Suda, aka Suda 51, of Grasshopper Manufacture and executive producer and Gung Ho Online president Kazuki Morishita. While specifics on much of the gameplay remain a mystery for the time being, their lengthy discussion has shed light on a number of other aspects, especially with respect to the development team’s creative goals and overall history of the game thus far. The interview begins with a brief discussion about the genesis of Let It Die and how it arrived at its current form. As it turns out, Let It Die is essentially the same game as the previously revealed Lily Bergamo that was shown off last fall, retaining the original idea of what the team is calling an “extreme action game” coupled with asynchronous online gameplay while expanding on them with survival aspects. While it remains uncertain as to whether character designer Yusuke Kozaki will continue to contribute work to the game in this new form, it was confirmed that protagonist Tae Ioroi is no more, as players are now set to just play the game using their own avatars. The transition to the game in its current form commenced around the end of last year as a result of the previously mentioned creative soul searching that Suda and company underwent. According to Suda, the basically gameplay conceit of Let It Die revolves around the idea of granting meaning to death in a video game. As such, the game is structured around the idea of death influencing gameplay, with one example being that if a player’s character dies in the game, their avatar can appear in another person’s game. While Let It Die still has some traditional AI enemies, the majority of NPC characters are stated to actually be dead player characters’ avatars. This means that as more and more deaths occur in the game, the more that death itself will play an increasing role in the overall experience. As Suda himself puts it, the title is meant to in part convey the idea that it’s okay to die over and over again, as that’s at the very heart of the game’s identity. Although information about the gameplay specifically remains sparse for the time being, Suda and Morishita did share a handful of tidbits about the overall structure and progression. 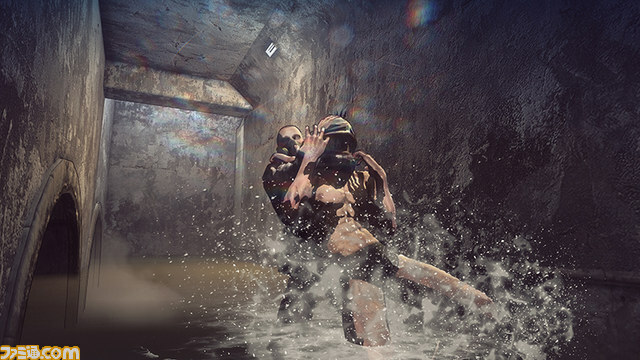 All players will begin unarmed, wearing nothing but underwear and a gas mask. 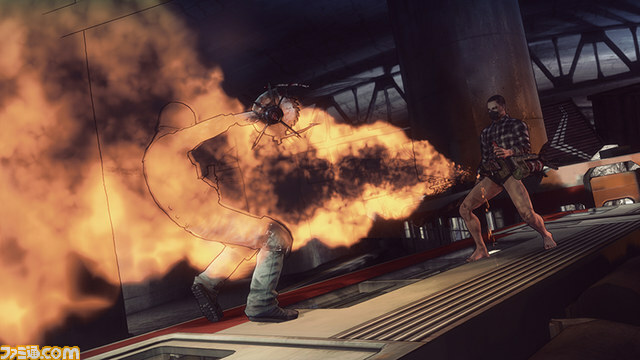 More equipment and weapons can be stolen off of defeated enemies, although there are stated to be other ways of accomplishing this as well given the game’s survival elements, which emphasize item procurement within a localized area. Per the “extreme action game” moniker, the game has a large emphasis on action, with each weapon having its own distinct characteristics. Additionally, while there is a levelling system in place, Morishita claims it isn’t as straightforward as it is in many other games and won’t simply result in players getting stronger and more resilient to death. Similarly, the game has no explicit ranking system as of yet, although there are plans in place to make it players’ strength relative to each other intuitively apparent. The overall goal of the game is said to be something along the lines of being number one in the world although, again, the specifics are still being hashed out at the time of the interview. The interview also touched upon Let It Die‘s free-to-play nature. While the development team is still deliberating how to go about monetizing the game, Morishita and Suda are both quick to emphasize that purchasable weapons aren’t being considered, as it’s believed that such a move would compromise the integrity of the game’s survival aspects. A smart phone companion app is also being developed in conjunction with the main game. Suda concludes the interview by saying that Let It Die is set to be a huge departure from his past work in terms of creative philosophy. Indeed, he says it lacks many of his major trademarks, including a major overarching plotline, a chapter-based progression structure, and in-game maps, among other things. Let It Die is slated to arrive sometime in 2015 for the PlayStation 4.